I sat in the middle of an “El Monte” twenty-something foot RV, with air conditioning feebly attempting to choke the heat from a Middle Tennessee summer day. A base beat thumped in rhythm to my pounding head. After getting evicted from the VIP campsite, we were close to The Who Stage. Or The What Stage. Or What The Hell Was I Thinking Stage. I hadn’t slept in 36 hours, so I might have hallucinated the entire thing. Hallucinations seem to be common at Bonnaroo, but my hallucinations weren’t the happy kind that left me smiling vacantly into space while unicorns danced on the horizon. Instead, I found myself imagining that the previous 36 or so hours did not encompass reality, but was simply one of those weird dreams where my high school band director morphs into my dad who then becomes my husband before he barks at me and pees on the rug. I may have mentioned this dream before. I bought a camper. We know this. A 1959 Tour-A-Home canned ham camper that I named Daisy. Boy Child restored Daisy. I started a blog about Daisy. All with the goal that Daisy’s first trip would be to Bonnaroo and like any southern debutante, she would sweep the world off its feet and go home with a full dance card. The sad truth is that I think maybe Daisy and I are too old for Bonnaroo. I’ve reached that irritating middle-aged stage when I believe that if I pay thousands (yes, it’s embarrassing to admit) of dollars to get my hippie daughter, her hippie friend, my nerdy son and his former girl frand to a music festival, plus hundreds of dollars extra for the VIP package then I will get, well, VIP treatment, or at least decent customer service. When I pay thousands of dollars, plus hundreds more for VIP and painfully learn that hippie daughter, her hippie friend, nerdy son and former girlfriend can’t get into our campsite and am advised by staff members to “go to Wal-Mart and buy a tent,” for them, I become a curmudgeon. Easy-going Spousal Unit becomes downright cantankerous. Spousal Unit HAD read that caveat and looked at me. “I TOLD you…” slipped out before he could bite his tongue. I didn’t hit him with my tie dyed hippie flag. The I-told-you-so was deserved and besides, I didn’t have the strength to wail at him. What neither of us saw – or still see after being told in no uncertain terms – is the rule that despite purchasing two VIP campsites and two VIP tickets/wristbands, our General Admission offspring and their friends would not be allowed entry into our campsite. We learned this only after setting up camp in two VIP spots, sitting back to finally enjoy the good vibes and live by the Bonnaroo code of Radiate Positivity after fourteen hours of journeying (only one-and-a-half hours from our home) when we got a call from Girl Child. “They won’t let us in,” she said. Spousal Unit and I looked at one another. What a drama queen. Of course, Bonnaroo staff had solutions. First they offered upgrades. For $200 extra per person without VIP passes, we could upgrade so that everyone had a pass. Well, that’s eight hundred bucks, but we’re already into it for the value of a Mini Cooper. Maybe that’s what we should do. A few minutes later, Spousal Unit called back with more colorful play by play. Not $200, but $500 per would upgrade the minors to VIP status. That’s two thousand dollars, for those without a calculator. They had another solution. They invited us to go to Wal-Mart and buy a tent for the girls to stay in out with the rest of the unwashed masses. Spousal glared at the guy who has just one job. “Do you see that beautiful girl over there?” he asked, pointing at Hippie Girl Child’s Hippie Friend. “I looked that beautiful girl’s father in the eye and I told him I would keep his daughter safe. And you WANT ME TO STICK HER IN A TENT IN A CROWD OF ONE HUNDRED THOUSAND PEOPLE!?!? !” Hippie Girl Child and Hippie Friend were becoming uncomfortable. As well as hot, dehydrated , hungry and a little sick. They had been away from the campsite for a few hours now, standing in the hot sun, waiting for resolution and Radiate Positivity to commence. Hours later, with two teenage girls near heat stroke and a husband near a fatal stroke, we reached a compromise with Bonnaroo staffers. We would forfeit the two VIP campsites and in return, they would allow us to park two camping vehicles in one handicapped spot. It’s my ability to negotiate that has taken me far in this world. Sure, you can have your way. I will give up several hundreds dollars worth of real estate for this one spot. Thank you sir; may I have another? Well into the 36th hour of Day 1 of our Bonnaroo experience, I sat in Monte-the-RV, grouchy and tired, feeling like some young whippersnapper just snatched this old lady’s purse. “Help! Po-lice! Help! 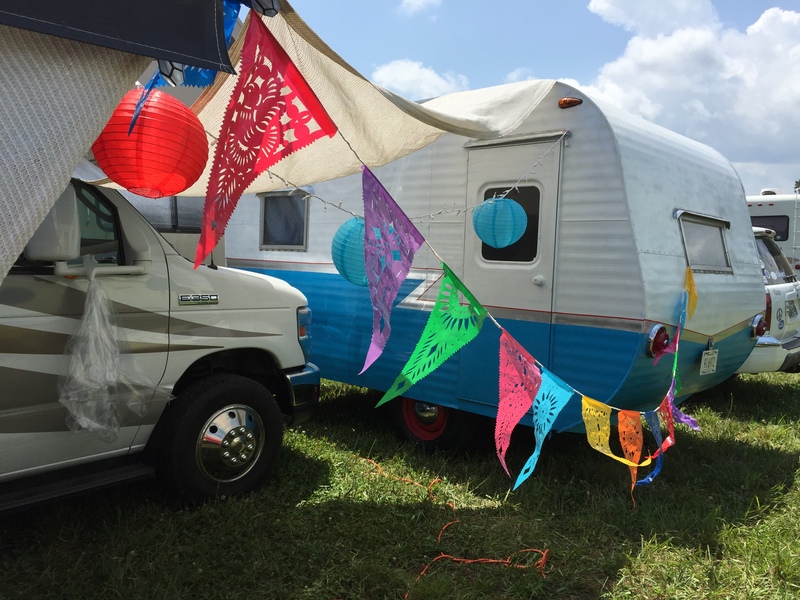 Those hippies took my VIP campsite away!” I wondered if my malaise and inability to “radiate positivity” meant that Daisy and I are only fit for Florida retirement trailer parks. Do I need to learn how to play shuffleboard, bingo and bridge, while Daisy gets a blue rinse? But I didn’t. And things got better. And that’s a different story for another time. If anyone thinks that this is an exaggeration in any way – I will assure you that this is very accurate. Holy crap – making plans to go next year?